Hull City showed some potential to escape relegation in the EPL. Hull City played a big part in determining the rhythm of the match, while Swansea played well in defense. Swansea played a large amount of long passes while also displaying some spurts of great positioning, which led to their win. Playing with 3 central defenders provided some build-up play stability against Swansea’s defensive shape. An interesting development that has recently become visible in the EPL is the use of the back 3. This creates some interesting reactions from defense. Usually, when a team plays with wide players AND fullbacks in the EPL we can see that the opponent wide players are oriented toward the fullbacks and fall back when the fullbacks move high up the field. This creates a sort of 6-2-2/6-3-1 formation from defenses in these situations, but with the 3 in the back from Hull and only two wide players Swansea was able to have quite a nice amount of compactness in midfield as well as in the defense. Obviously, in the 6-2-2/6-3-1 types of progressions – the midfield level of defenses have less numbers and are more easily manipulated. So, Hull played in a 5-3-2 with the wingbacks pushing very high up the field. *Hull City’s left wingback, Robertson, is a nice talent. An eye should be kept on this young Scottish player. Swansea’s wide players did not orient toward the Hull City wingbacks. Instead they looked to tuck inside into midfield. Swansea’s fullbacks were the ones who would deal with Hull’s high wingbacks. As a result, Swansea had good horizontal compactness in both midfield and in defense. This seemed more as a result of the game rather than a strategic ploy by Monk. As Hull’s wingbacks pushed high into midfield, the back three spread out wide. They had both numbers and space conquered in regards to building from the back against Swansea’s 4-4-2 defensive shape. Swansea’s front 2 stayed deeper around the defensive midfield area of Hull City instead of pressing the back line. From this base, Hull played many long passes up front because they had difficulty playing shorter and lower passes through the compact Swansea midfield. Swansea played well on defense, flexibly interchanging marking responsibilities throughout zones. Part of the difficulty that Hull faced in the build up phase was due to the fact that they lacked efficient positional structure when in possession, which would allow them to better find, create, and expose the holes in Swansea’s zonal coverage. They lacked the connections and correct distances in relation to each other and the opponent to play well. So with these high numbers upfield, Hull would look for knock-on balls through Swansea’s defense and they also looked to press the 2nd balls aggressively if they could not successfully knock it on. Though their counterpressing was uncoordinated and Swansea easily escaped, which had some interesting effects. Hull did have problems when it came to technically executing the final pass or the the shots on goal, but they had moments with impressive build up play. Especially when Robertson was involved on the left. Even though Swansea were compact, they tended to lean more towards man orientations in midfield at times. This was exposed more often as the first half went on and Hull were able to play shorter and flatter passes through Swansea’s midfield rather than the long high passes. This resulted in some nice combinations and chances. 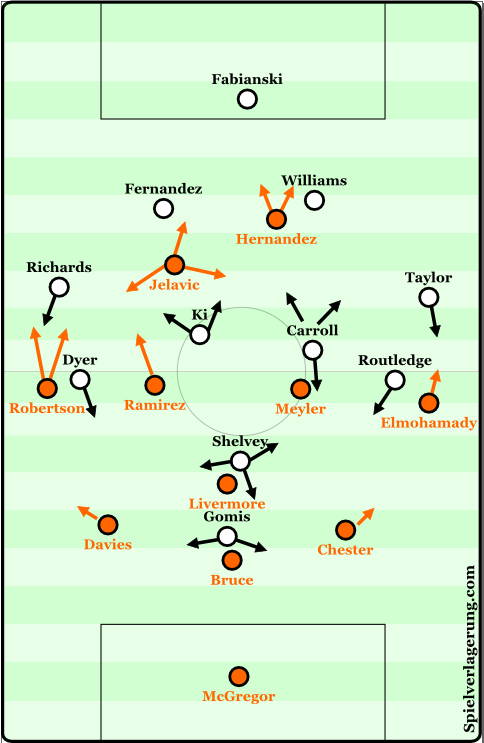 Later in the game Hull City switched to a 4-4-2 with a similar high and aggressive attitude in regards to positioning. Now Swansea’s wide midfielders tracks the fullbacks of Hull and left more spaces in midfield to be exploited by Hull City. This resulted in Swansea being pushed back even further towards their own box and having difficulty defending. Swansea has had problems finishing out games where they had a lead and I suspect this is a large reason as to why that happens. Because of Hull’s large numbers in attack, long passes, and uncoordinated pressing, the game had a strange rhythm. Swansea played long passes and shot from far out areas most of the time, rather than their usual shorter and more patient build up play. Because Hull determined the rhythm of Swansea’s play in a manner which fits Hull, they had an impressive showing against Swansea. This is part of the reason I believe they will mostly likely avoid relegation in EPL this season. Here is a graphic by Michael Caley which predicts the position of the bottom of the EPL table based on ExpG, or Expected Goals. This is measured by assigning a value to the shots a team takes and the likeliness of scoring from that position determined through analyzing many previous shots from a similar position. The higher the number, the higher chance of a goal – and therefore a higher chance of winning most of the time. The best teams are able to take many good shots and therefore have a higher rating in this field. This is usually a good sign of who will be more successful and who will struggle. Right now Hull is 3 places clear of the relegation zone. This is most likely due to the fact that they are starting to take advantage of the good situations they create for themselves semi-regularly. They seem like a team who is worthy of staying in the first division of England. Hull isn’t perfect, but they show enough signs of good play regardless of whatever their tactical and technical deficiencies may be in comparison to the other teams in the league or in the relegation battle. Because of Swansea’s long passing and long shots they had a small amount of players involved in the attack, and the rest of the players focused on a stable defensive structure. This could have been within Monk’s strategy to avoid counter attacks by Hull City. Though it seemed more like a forced rhythm by the environment created in the match by Hull’s play. Swansea’s breaks seemed especially dangerous later in the game when Hull committed more players forward in their 4-4-2. Swansea’s goal came from a scene in the match where they were able to have an extended period of possession in Hull’s half. Hull, in contrast to Swansea’s normally great defensive access, had poor defensive access to the ball. Hull’s 5-3-2 meant low numbers in midfield. This allowed Swansea to play most of the passes they wanted to play without pressure, not including passes through the defensive line – where Hull had 5 defenders. This helped create situations where Swansea would shoot from long distances more often. Though it was a mix of having a higher amount of players in Hull’s half to create a better positional structure, and taking long shots that made Swansea more stable in all phases. Hull City showed signs of a team that could continue playing in the premier level of English football in this match. Swansea played quite stable in most phases throughout the game. It will be exciting to see how the second half of the EPL develops. I suspect Hull will avoid relegation, while Swansea maintain their position just outside the top 5 or 6 teams – remaining in the top half.